Mesenteric adenitis is a usually mild condition which is characterized by the swelling (inflammation) of lymph nodes located in the 'mesentery' tissue of the abdomen. The condition is a fairly common cause of temporary pain and discomfort in the abdomen (stomach), especially in children. Mesenteric adenitis -- which is also sometimes known as Mesenteric lymphadenitis -- typically affects children and teenagers aged less than 16 years. Its occurrence is comparatively less common in adults. The lymph nodes which become swollen and inflamed in Mesenteric adenitis are a part of the lymphatic system of the body. They are small, bean-shaped organs which contain white blood cells called lymphocytes, and play a crucial role in the immune system. Lymph nodes are chiefly responsible for filtering out bacteria and other germs from the lymph fluid, in order to enable the body to eliminate these harmful substances and fight disease. 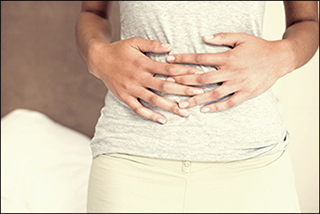 The most common causes of the occurrence of Mesenteric adenitis are viral infection -- generally a stomach virus or a cold virus -- and inflammatory conditions. Sometimes, very rarely, the inflammation of mesenteric lymph nodes may result from certain types of cancer, including Lymphoma, Gastrointestinal cancer, Breast cancer, Lung cancer, and Pancreatic cancer. Although Mesenteric adenitis is usually not a serious condition, it may sometimes lead to a few complications which can include: joint pain (Arthralgia), dehydration due to severe diarrhoea or vomiting, Abscess (pus in the abdomen), Peritonitis (inflammation of the membrane surrounding the outside of the organs in the abdomen), and Sepsis (resulting from an infection causing systemic inflammatory response syndrome). Mild and uncomplicated cases of Mesenteric adenitis, as well as those caused by a virus, generally do not require any treatment as they get better on their own. However, for more serious cases, doctors mostly prescribe certain medications, including over-the-counter pain relievers and fever reducers. In case of moderate to severe bacterial infection, some antibiotics may also be prescribed. 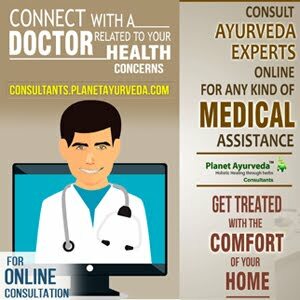 For the management of Mesenteric adenitis, herbal manufacturing company Planet Ayurveda offers some excellent herbal formulations which can relieve the abdominal pain and discomfort associated with the condition. The herbal formulations are prepared from pure and natural herbs, under the supervision of renowned Ayurveda practitioners. Prepared from some very potent and well-known herbs, these capsules are considered to be an amazing product for maintaining the overall health of the digestive system. The herbs which are combined for preparing these capsules include: Amla (Emblica officinalis), Haritaki (Terminalia chebula), Jeerak (Cymium cumium), Sounf (Foeniculum vulgare), Pippali (Piper longum), Dhania (Coriander sativum), and Bahera (Terminalia bellerica). The use of these capsules is beneficial for the patients of Mesenteric adenitis because they assist in proper digestion of the food, maintain the natural PH of the stomach, improve appetite, maintain proper metabolism of the body, boost the immune system, rejuvenate the body, and balance the body's three doshas --- Vata, Pitta and Kapha. Dosage: 1-2 capsules, two times a day. To prepare these tablets, a number of beneficial herbs are combined, including Kanchnaar (Bauhinia variegate), Guggulu Resin (Commiphora mukul), Amalaki (Emblica officinalis), Haritaki (Terminalia chebula), Bibhitaki (Terminalia bellerica), Ginger (Zingiber officinale), Black pepper (Piper nigrum), Pippali (Piper longum), and Varuna (Crataeva nurvala). These herbal components of these tablets can benefit Mesenteric adenitis patients because of their ability to manage a number of health conditions, including Obesity, Cancers/Tumors, Lipoma (tumors which consist of fatty tissue), Liver cysts, Hypothyroidism, Fistula, Skin diseases, Polycystic kidney disease, and Polycystic ovarian syndrome. Dosage: 2 tablets, 2-3 times a day. To prepare this extremely beneficial formulation, natural herbal extract obtained from the 'Giloy' herb (Tinospora cordifolia) is used. The herb is known for its proven anti-inflammatory, antioxidant, immune-boosting, anti-cancer, and antipyretic properties. People suffering from Mesenteric adenitis can benefit from the use of these capsules as they are capable of treating chronic fever, managing gout and cardiac debility, treating several skin conditions, curing anaemia, enabling the body to fight infections, and managing jaundice, leprosy and different types of cancers. These tablets are prepared from the bark extracts of the 'Kutaj' herb (Halorrhena Antidysentrica), which is widely-known for its anti-diarrheal, anti-dysentrica, anti-amoebic and hemostatic properties. The use of these tablets is very beneficial for treating intestinal infections/disorders, managing conditions like dysentery and severe diarrhoea, curing ulcerative colitis, enhancing the functioning of the intestines, treating inflammation, and eliminating toxins from the body. Some extremely useful natural ingredients are combined for the preparation of these capsules, including Amalaki (Emblica officinalis), Spirulina (Spirulina platensis), Green tea (Camellia sinensis), wheat grass (Triticulum aestivum), and grape seed (Vitis vinifera). These capsules can be used by patients of Mesenteric adenitis because their herbal components have the capability to boost the immune system, help the body fight against free radicals, provide nourishment to the brain cells, enhance brain functioning, and manage skin ailments and other conditions. The standardized extract of well-known 'Ashwagandha' herb (Withania somniferum) is used for preparing these capsules. The extremely potent herb is known in Ayurveda for its proven anti-inflammatory properties and immense medicinal value. The use of Ashwagandha capsules is beneficial in managing Mesenteric adenitis because the herb has the ability to manage inflammation, enhance a person's overall mental health, reduce metabolic imbalances, improve brain function, support nerve functions, strengthen the muscles, and balance the body's Vata and Pitta doshas. 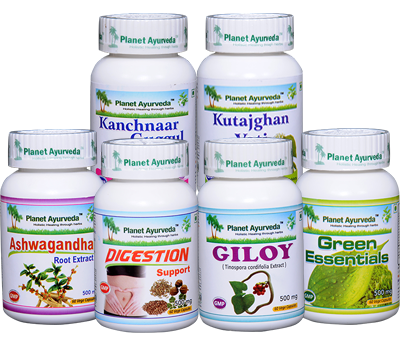 The herbal formulations offered by Planet Ayurveda can effectively manage Mesenteric adenitis in a natural manner. The use of these formulations is completely safe because they are 100% vegetarian formulations, which do not contain any chemicals, additives, yeast, starch, colors, preservations, fillers or binders.